This is the fifth and final part in the series of blog posts covering the Explanation of the Common Service, published in 1908, by the old General Council of the Evangelical Lutheran Church in America. This was the organization founded by leaders of the 19th Century Confessional Lutheran movement, most notably Charles Porterfield Krauth. The Explanation was written out of loving concern for Lutheran youth, being dedicated to "young Lutherans who ask the meaning of the beautiful liturgy of the Lutheran Church," that they would come to an understanding and appreciation of the liturgy and thus preserve this beautiful gift of the Church to following generations -- that christocentric and sacramental practice would continue to accompany and reinforce our christocentric and sacramental Lutheran doctrine in a manner that is distinctively ecclesiastical. Such practice is a far cry from what some would choose to exchange it for: anthropocentric, sacrificial practice that is distinctively worldly. Part One of this series covered the Foreword and Introduction of the Common Service. Part Two covered the Invocation through the Preparation. Part Three covered The Office of the Word, and Part Four covered The Holy Supper. 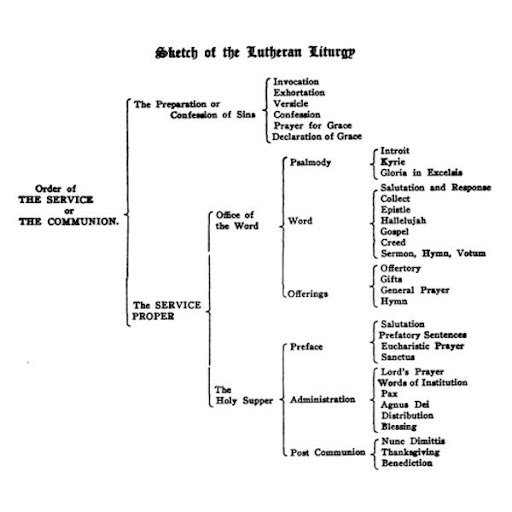 In this final post we include the sketch above -- a graphic depiction of the Lutheran Liturgy as embodied in the Common Service, the meaning of which was opened up to us in Explanation of the Common Service -- for those who appreciate visual aids to get a summary view of detailed information. In addition, we post from material toward the end of the Explanation, covering a brief history and explanation of Christian hymnody and a brief explanation of the liturgical colors that complement the liturgical Church year. Before proceeding with this latter material, however, I thought that I would post the following quotes from a vitally important Lutheran book, The Conservative Reformation and its Theology, by Charles Porterfield Krauth. Published in 1871, this work embodied his vigorous and scholarly attempt to unite the various Lutheran church bodies in America under the Lutheran Confessions. It was a time of Confessional renewal, of the sort needed in all of Lutheranism today. The Conservative Reformation is currently being reprinted by Concordia Publishing House, as is its companion works by Schmauk and Benze, The Confessional Principle and the Confessions of the Lutheran Church. [quoting Goebel] 'The Lutheran Church has a great pre-eminence of the Reformed in regard to its internal theological development. German theological science comes forth from the Lutheran Church. The theology of the Lutheran Church supported by German diligence, thoroughness, and profundity, stage by stage, amid manifold struggles and revolutions, arose to an amazing elevation, astounding and incomprehensible to the Swiss, the French, and the English.' 'The Lutheran Church,' says Lange, 'is the Church of theologians'. ...At once as a cause and a result of this greatness in the highest form of learning, may be regarded the fact that the Lutheran Church is an Educating Church from the humblest sphere of the children of the poor to the highest range of the scholar's erudition [referring to 'catechetical instruction, congregational and public schools, and universities']. ...Many embarrassing circumstances prevented the Lutheran Church from developing her life as perfectly in her church constitution as in her doctrines and worship... But especially in sacred song has the Lutheran Church a grand distinctive element of her worship. 'The Lutheran Church,' says Schaff, 'draws the fine arts into the service of religion, and has produced a body of hymns and chorals, which, in richness, power, and unction, surpasses the hymnology of all other churches in the world.' 'In divine worship,' says Goebel, 'we reach glorious features of pre-eminence. The hymns of the Church are the people's confession, and have wrought more than the preaching. In the Lutheran Church alone, German hymnology attained a bloom truly amazing. The words of holy song were heard everywhere, and sometimes, as with a single stroke, won whole cities for the Gospel'. ...[quoting Nevin, a contemporary of his in the German Reformed Church, and nemesis of Charles Hodge in Reformed circles of the time] 'We have no wish to have the Lutheran Church overwhelmed in this country by the reigning unhistorical spirit of our American Christianity – no wish to see it Americanized, in the sense of anything like a general rupture with its original theological life. The whole Reformed church here, whether it be perceived or not, has a vast interest at stake on the power of the Lutheran Church to remain true and faithful to her confessional mission.' ...That such a Church has a mission of extraordinary importance in this land [America] in which exist such dangerous tendencies to sectarianism and radicalism, and whose greatest need is the cultivation of historical feeling, under the restraint of a wholesome conservatism, requires no argument. ...The catholicity of the range of our Church among nations, in which she is entirely without parallel among Protestant Churches, does, indeed, make the problem of the fusion of her elements very difficult; but it is the very same problem which our nation [America] has had to solve. Krauth, C.P. (1871). The Conservative Reformation and its Theology. Philadelphia: Lippincott. (pp. 151-160). These words supply an ample preamble to what follows, in this last post in a series covering the Explanation of the Common Service -- a work published by Krauth's own General Council in 1908. A HYMN is a sacred song. A Christian hymn is one that embodies Christian truth, or gives expression to Christian belief and feeling. "Know ye," asks St. Augustine, "what a hymn is? It is a song with praise of God. If thou praisest God and singest not, thou utterest no hymn. If thou singest and praisest not God, thou utterest no hymn." There are two kinds of hymns, inspired and uninspired. The inspired hymns are all found in the Holy Scriptures. These are the Psalms and all of the Canticles, except the Benedicite which is found in the Septuagint, but not in the Hebrew Bible, and the Te Deum, which is an ancient Christian hymn. The inspired hymns are all Hebrew in form. The principal characteristic of Hebrew poetry is the parallelism or responsiveness between the two parts of each verse. For instance, in the second verse of the fifty-first Psalm, we read, "Wash me thoroughly from mine iniquity: and cleanse me from my sin." Here the second clause parallels and balances the first, reproducing the same general idea, but in other words and with a slight variation in the thought. In Psalm 119:113, the two clauses are sharply antithetical. In Psalm 1:1, there is a regular progression in the thought. Again, the second clause supplies the reason for what is said in the first, as in Psalm 16:1, or it may state the results which follow, as in Psalm 23:1. On account of this parallelism, the psalms should always be rendered antiphonally, whether they be read or chanted, each verse being divided for this purpose by the colon. With the exception of a few, which are numbered with the Canticles, the uninspired hymns of the Church have taken the form of compositions with metre and rime. In this the Church has followed "the universal promptings of human nature peculiar to no age, which in sacred compositions, as in others, looks for smoothness and ease, for the music of language, for the assistance to memory, and for something to rivet the attention; to which the music may form an harmonious accompaniment." For a long time the preference of the Church was for the Psalms of the Bible; and it is very probable that before the hymn found its way into the Service, it was in common use among the people. Only gradually, because of its value as a means of spiritual edification, did it win for itself a place in public worship. At first, the popular use of the hymn was confined to the heretics, who employed it in the spread of their false doctrines among the people. In self-defense orthodox writers composed numerous hymns, which finally displaced the songs of the heretics. Many of these ancient compositions are still in use in the East, and some of them, in translated form, throughout the Church. Among the very first composers and users of uninspired Christian hymns were the Syrians, whose language closely resembles if it is not identical with the language which was spoken by the common people of Palestine in the time of our Lord. The Syriac hymnody was rich and full, and in general use for a thousand years and more. The main stream of Church hymnody, however, takes its rise in the Greek Church of the East. The oldest of all Christian hymns is a Greek hymn of Clement of Alexandria (170-220). The later Greek hymnody reached its zenith at the close of the eighth century. Latin hymnody originated in, and was derived from, the Greek hymnody of the East. The earliest names which can be connected with any Latin hymns, occur at the beginning of the fourth century. But from the fourth to the sixteenth century, the Latin is the main stream of Christian hymnody. It contains the best of the Greek, and was the inspiration of the majority of the first German hymns. Hundreds of the old Latin hymns, in translated form, are in common use in the Christian Church today. "The Church hymn, in the strict sense of the term, as a popular religious lyric in the praise of God to be sung by the congregation in public worship, was born with German Reformation." German hymnody surpasses all others in wealth. The number of German hymns cannot fall short of one hundred thousand. "To this treasury of song several hundred men and women of all ranks and conditions – theologians and pastors, princes and princesses, generals and statesmen, physicians and jurists, merchants and travelers, laborers and private persons – have made contributions, laying them on the common altar of devotion." The treasures of German hymnody have enriched churches of other tongues and passed into Swedish, Norwegian, Danish and modern English and American hymn-books. Luther was the leader in the reformation of the doctrine and the worship of the Church; he was also the first evangelical hymnist. "To Luther belongs the extraordinary merit of having given to the German people in their own tongue, the Bible, the Catechism and the hymn-book, so that God might speak directly to them in His Word, and that they might directly answer Him in their songs." Luther's example inspired many others to compose evangelical hymns, so that by the middle of the sixteenth century a large number of them were in common use. After the period of the Reformation German hymnody was constantly enriched. Where there are so many famous names which claim attention, space forbids more than the mention of the very greatest hymnist since Luther, Paul Gerhardt (1607-1676). In poetic fertility he greatly surpassed Luther, and his one hundred and twenty-three hymns "are among the noblest pearls in the treasury of sacred poetry." The several English Lutheran hymnals now in use, all contain translations from the principal German hymn-writers of the last four centuries. In Sweden, the first evangelical hymn-writers were the two renowned brothers, Olaf and Lars Peterson, the chief assistants of Gustavus in the work of reformation. But the greatest name in Swedish Hymnody is that of Johan Olaf Wallin, who at the beginning of the nineteenth century revised the hymn-book, contributing to it about one hundred and fifty hymns of his own. This book remains in the form in which he brought it out. It is highly prized by the Swedes, and is used everywhere. Claus Martenson Tondebinder (1500-1576) was the father of Danish hymnology. He issued what was perhaps the first complete hymnary of the whole North. "The Hymn Book for Church and Home Worship," which is in use in Denmark today, may be traced back through many revised and supplemented editions to Tondebinder's "Handbook" published in 1528. The Norwegians have in the main followed the lead of Denmark in their hymns. Several hymn-books have been in use in Norway, but the one most generally used is "The Church Hymn-book," edited on the basis of existing books by Magnus B. Landstad (b. 1802) and authorized in 1869. A supplement was added in 1892. In Iceland, for a long time, the hymn-book consisted of translations of the earlier hymns of the Danish hymnary. It was published under the name of Graduale which was explained to mean Messu-saungs bok (The Mass-song Book). The last edition was issued in 1773. A new hymn-book, of the first rank among modern Lutheran hymn-books, appeared in 1886. The Bible Poems of Valdimar Briem (b. 1848), have placed him in the first rank among modern hymnists. The Father's love I gain. My soul from Jesus' heart." "The English hymn singing at the time of the Reformation was the echo of that which roused the enthusiasm of Germany under Luther. The most notable proof of this is found in Coverdale's Goostly Psalms and Spiritual Songs." Most of the book "is a more or less close rendering from the German; and some of the finest hymns are Luther's." As oft as we repent and sin refrain." Very few original English hymns are of earlier date than the close of the seventeenth century, and the actual development of English hymns began among the Nonconformists, the Baptists and the Independents. Isaac Watts (1674-1748), who lifted English hymns out of obscurity into fame, may justly be called the father of English hymnody. After him, Philip Doddridge (1702-1751) may be mentioned. But the greatest English hymnist, and one of the greatest hymn-writers of all ages, was Charles Wesley (1707-1788). He is said to have written no less than sixty-five hundred hymns, and it is perfectly marvelous how many of them rise to the highest degree of excellence. It is an interesting fact that his brother John's little collection of Psalms and Hymns, which was one of the very first attempts at an English hymn-book, was published at Charlestown, while John Wesley was among the Lutherans in Georgia, in 1737. At the beginning of the nineteenth century, the use of hymns was still a new departure in the order of divine worship in the Church of England. Until the middle of the century, the Dissenting element made up nearly two-thirds of the total contents of the hymn-books in use in this Church. Since then Church of England writers have greatly added to the number of English hymns, translating many of the best Latin and German hymns and producing many more of original composition. America has already produced a large number of hymn-writers. Naturally, English Lutheran hymnody is yet in its infancy. However, the proposed "Common English Hymnal" for Lutheran congregations, contains original hymns by Joseph A. Seiss and Henry E. Jacobs, and translations by Dr. Seiss, Charles Porterfield Krauth, Charles W. Schaeffer and Harriet R. Spaeth. As St. Chrysostom says, "Nothing gladdens the soul like modulated verse – a divine song composed in metre." It was Luther's purpose to inculcate the word of God in the hearts of the people by the use of song. The hymn as such is not intended to be didactic, and yet it is one of the surest means of conveying sound doctrine, and perpetuating it in the Church. St. Paul himself recognized the use of Christian song in teaching (Col. 3:16). Moreover, it is chiefly by the use of the hymn that the participation of the congregation in public worship is secured. The purpose of the hymn in the Service depends upon its position, although in general it may be said that its principal object is to awaken and stimulate devotion. Doddridge's hymns were sung as the enforcement of his sermons, and were probably given out from the pulpit, line by line. Sometimes the hymn serves as a preparation for what follows, as does the principal hymn in Matins; again it is the form in which the congregation appropriates what has preceded, as in the principal hymn in Vespers. The office of each hymn used in the Common Service, and the kind of hymn to be used, have been indicated at the proper places in this Explanation. The above is the order recommended by the General Council. Another rule of good authority prescribes Violet from Septuagesima to Maundy Thursday, included. Violet. – A shade of purple, the color of royalty. It symbolizes the majesty of Christ in His humility. Being a sober, earnest color, it invites to meditation, and has been adopted by the Church for the two great seasons of preparation – seasons of fasting and prayer. White. – The color of light. Also of those who minister in God's presence – Angels, Rev. 15:6. The Elders, Rev. 4:4. The Saints in heaven, Rev. 7:9,14. Hence, those who minister in holy things in the Sanctuary may appropriately be robed in white. This color symbolizes Divinity, Dan. 7:9, Matt. 17:2; purity, Rev. 19:8; victory, Rev. 3:4,5; 6:11. Green. – The common color of nature, in the freshness of her bloom. Restful to the eye, and widely diffused, it is used by the Church for her common seasons. It is also symbolic of the Christian life, which is the fruit of God's grace, set forth in the services of the Season when nature dons her green vesture and brings forth her best fruits. Red. – The color of blood and fire. It is symbolical of sin and its atonement. Also of the Church, redeemed by the blood of Christ, and testified by the blood of martyrs. Her faith and zeal are enkindled and perpetuated by the fire of God's Holy Spirit. Black. – The color of darkness, the absence of light. Symbolical of death, and the deepest sorrow and humility.